Hosted by the online ministry Sanctuary First and Falkirk Presbytery the conference looked at some of the most exciting new initiatives underway in local churches as well as allowing participants to worship, pray and network together, and to visualize a renewed and energised Church. The conference was created to give opportunities to consider the kinds of changes needed to meet the 2018 General Assembly’s demand for a radical action plan for the Church. It was one of a number of conferences and events— including a Presbytery of Glasgow meeting on the same weekend—that are following up on a 2018 General Assembly deliverance that instructed the Council of Assembly to return in 2019 with a radical action plan and called on Kirk sessions and Presbyteries to reflect on the state of the Church and on their mission and vision. In October 2018, a Commission of Assembly created a special Commission on governance to make recommendations designed to ensure the Church’s national structure is ‘lean and fit for purpose to lead reform’. That commission has been meeting with council members and presbyteries representatives. Now its members are asking all church members to send them their views. Share your views. Rev Iain Cunningham was part of a praise band that helped get the event underway. As Christians we know our roots go back to the beginning of humanity, he said, and those “roots are our nourishment.” Looking to the future, he said, we know that we are called to be a community of faith in Christ’s image. Sanctuary First is creating a way for people who no longer want to attend traditional services to worship and connect with church, Mr Bogle said. “We are trying to hold a group of people together who have given up on Church. It doesn’t mean we don’t love Jesus. It means we are so frustrated we are crying on our back for Jesus to visit us again. Rev Peter Neilson, who was convener of the Special Commission for Review and Reform that produced the CWW report, spoke to the gathering via a video, reflecting on the different ministries of the four Evangelists and Gospel writers, Matthew, Mark, Luke and John. Matthew was the teacher who valued order and tradition but had a subversive streak. Matthew pushes us to undertake inner change, to nurture seeds of change and to honour “the least” among us. Mark was the man of action who overcame obstacles through his faith and challenges us to take the way of the cross. Luke was an outsider, a Gentile who valued listening and storytelling and embarked upon the adventure of taking the Good News to everyone on earth. John was the reflector who looked deeply into Jesus’ identity as the Son of God and found the answer in the Resurrection. John exhorts us to be prayerful and conversational with one another. Mr Neilson urged the gathering to reimagine the Church from the perspective of each of the Evangelists. Technology has given us new ways to communicate, he told the conference, but in an age where most people are uploading selfies that present an image that is flawlessly beautiful and happier than their true selves, the key to being Church online is to be honest, transparent and true to our real human selves. We are “flesh and blood human beings made in the image of God,” he said. “That is the special, unique wonder of being human in a digital age. Dr Phillips also introduced the idea that people today are seeking experiences, and that this explains the success of some online mega-ministries. This craving for experiences also explains the popularity of cathedrals and “high-church” worship, he said, because all the senses are engaged with music, incense and soaring art and architecture. Church has the capacity to deliver the “wow” factor that people are craving, he said. “A bunch of people following Jesus: How can this be life changing, transformative? The keynote speech from the academic and author Professor Len Sweet was delivered via a videolink to the West coast of the United States. Professor Sweet talked about the signs and symbols in the Gospel story, focusing on little understood images, such as the almond and the mandorla, and saying the future of the Church depended on Christians knowing and learning our own Bible stories better than ever before. “Jesus answered questions with signs,” he said. “He used the coin with Caesar’s image on it to say ‘Give to Caesar what is Caesar’s.Give to God what is God’s.’And what is that? “That is you. We bear within us the image of God. As God’s people, we are called to spread the Good News, he said, and we have to do this in a way that fits for the 21st Century. Professor Sweet showed two video adverts that used animals to evoke emotion in the viewer. What they show is the power of story, images and soundtrack to move people to action, he said. Participants were able to choose from a range of workshops that showcased the creativity and innovation underway in different areas of the local church. Sarah Jane Storrie, an architect and former member of CARTA helped people look at Sacred spaces and how congregations can rethink their buildings. 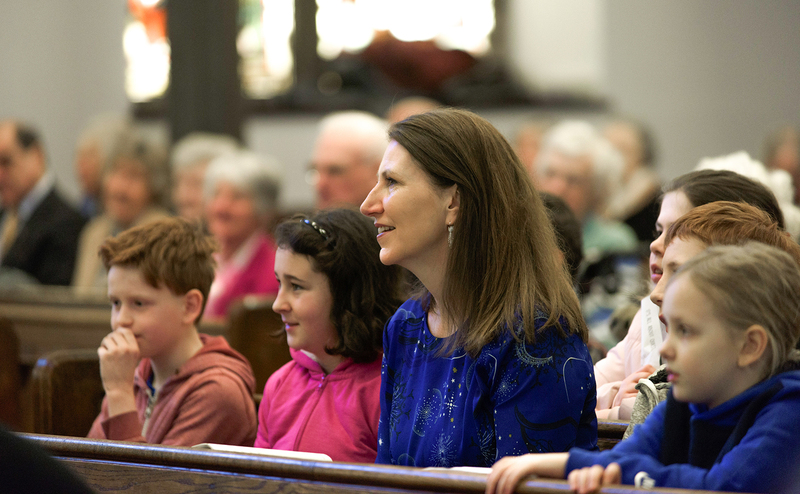 Rev Liz Crumlish took a deeper look at the Path of Renewal initiative, which has transformed congregations across the country. Rev Marc and Anthea Bircham shared their experience of fundraising, gathering community support and moving from a traditional church building to a new purpose-built church centre at St Madoes. Rev Maggie Lane shared her views on the importance of recognising people’s different gifts and approaches to ministry. She explained how her belief that she is called to prophetic ministry has helped her congregation reach out to families and children. Rev Neil Glover spoke about the Hub ministry initiative, explaining how it offers an opportunity to create a more interdependent and flexible ministry that can be especially useful at a time when the demand for ministers has outpaced their numbers. Rev Russell McLarty offered a practical session that showed how visioning exercises can help people bring their imagination and creativity to bear on the future of the Church. Rev Linda Pollock shared her experiences of ministry with young people, encouraging particpants to create pathways for young people in their own communities to connect with the Church. Rev Neil Urquhart shared his work with Fullarton Connexions, where his church is involved in numerous community partnerships and activities that benefit people of all ages. Very Rev Albert Bogle conducted a session on connecting to faith online, discussing the work of Sanctuary First, which now delivers daily prayers and livestreams worship as well as publishing inspiring videos and blog posts. You will be able to view all the workshops and many other sessions on the Sanctuary First website once they have been edited and posted. The General Assembly of 2019 will consider proposals for a Radical Action Plan which emerge from discussions organised by the Council of Assembly that are underway across the Church. Rev Robert Allan, minister at Falkirk Trinity church has written a blog about the conference here. For those interested in what other churches are doing to reinvigorate their mission, this article explains some of the more innovative projects underway south of the border.